We live in rural Northern England with a few tiny, fluffy creatures. Our hobbies include: making crafts, playing games, reading books and watching movies, football and formula 1. Most of our free time is currently spent decorating our home or visiting family and friends. Our favourite holiday places include: Northern Wales, Whitby, and the Outer Banks (USA). 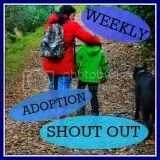 Pre-2013, we joined Adoption UK, enquired at adoption agencies and attended an information meeting at Rural agency. We decided it was time to start the process and contacted our top three adoption agencies (Big City, Little City and Rural). Little City sent us an information packet and invited us to an information meeting (with only a week’s warning!). We attended their information meeting and felt positive about the team at Little City. A social worker from Rural called us for our first viability assessment and decided to recommend us to their monitoring committee. Finally, an administrator from Big City called us to take some details (a mini-viability assessment) and said that they would send a letter inviting us to an information meeting (also with only a week’s warning!). We never received the letter from Big City, though we did get a call from the same administrator attempting to take our details again! We spoke with a social worker from Big City later that week, who apologised for the mix-up and said they would send out an invitation to the next information meeting in April. In the meantime, Rural sent us a letter informing us that the monitoring committee decided to proceed with our enquiry and a social worker would call as soon as possible to arrange a home visit. We called Little City to arrange a similar home visit. They asked us to complete and submit a request form, which we sent immediately. We still haven’t heard from Big City about their information evening in April. We decided to remove them from the shortlist. We met with a social worker from Rural who decided to recommend us for preparation group. We grilled the social worker about the Rural adoption agency and were pleased with the answers. Hand-stitched dad and I decided to apply to Rural. We are waiting to hear from them about whether we need early medicals. At this rate, we could potentially be approved for Christmas.